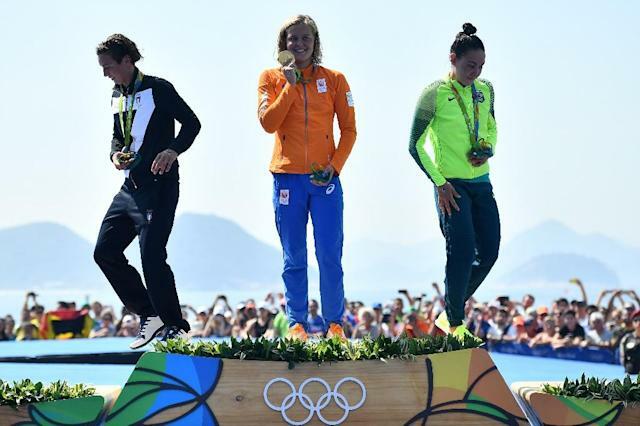 Rio de Janeiro (AFP) - Dutch swimmer Sharon van Rouwendaal romped to 10km open water gold at the Olympics on Monday as the course layout sparked more controversy at the under-fire Copacabana beach venue. Van Rouwendaal, whose training was hindered by a shoulder injury for eight months earlier this year, made it look easy as she powered to victory in 1hr 56min 32.1sec. Behind her there was a fierce battle for silver raging, and her French training partner Aurelie Muller appeared to have nabbed it. But Muller was disqualified for impeding Italian Rachele Bruni, who ended up in second ahead of bronze medallist Poliana Okimoto of Brazil. Muller departed the picturesque crescent beach in tears after she swam into her rival in the finishing chute, French team officials saying she was confused because the tall buoys marking the start of the lane were improperly aligned with the buoys at the finish line. Disoriented, world and European champion Muller veered into Bruni when she realized she wasn't headed for the timing board. Bruni, who only knew that Muller pushed her arm down at the finish, clocked 1:56:49.5 -- a whopping 17.4sec behind van Rouwendaal. Okimoto snared bronze - a first Olympic swimming medal for a Brazilian woman -- in 1:56:51.4 -- 19.3 seconds off the lead. Okimoto expunged the bitter memory of the London Games, where she had to be fished out of the water suffering from hypothermia. "Today I was prepared to do everything and this was the best event of my life," she said. "God is Brazilian." The margin of victory dwarfed those in the two previous Olympic editions -- it was less than one second in London and 1.5 seconds in Beijing. "I felt so good, I swam so easy," van Rouwendaal said. "I didn't feel any fatigue so after 6km I changed my mind and thought I should push on," she said. "I kicked hard for about 200m and looked back to see that I'd opened a gap. From there I just used my arms and paced the race. I didn't feel any fatigue until the very end." 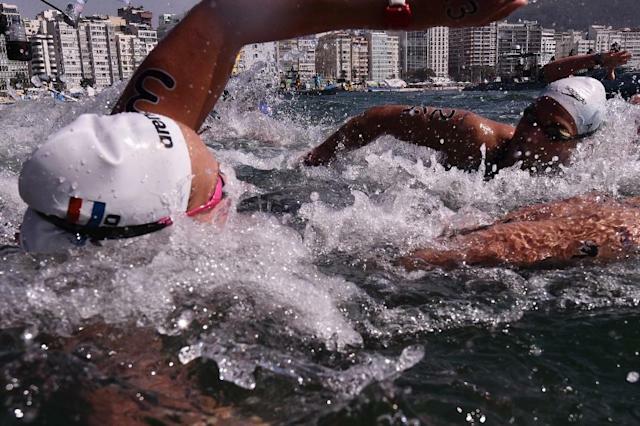 The open water competition in Rio marked a return to Olympic swimming's ocean roots. Swimming in the first modern Games, in 1896, was held in the Bay of Zea. But the sport moved to the pool in 1908 and since marathon swimming was added to the programme in 2008 it's been held in contained bodies of water -- the rowing center in Beijing and the Serpentine in Hyde Park in London, rather than the sea. Copacabana provided one of the most beautiful backdrops Rio has to offer, but the sewage-tainted wanters of Guanabara Bay raised fears of health dangers for swimmers as for sailors and rowers. The venue suffered another disaster on Saturday, when the starting platform was destroyed by strong currents 48 hours before the start of competition. With no time to replace it, the field of 26 strode across the sand, waded into the surf and swam out to the starting marker as a crowd of fans, teammates and assorted beach-goers cheered. It made for a festive show, even though FINA's open water rules stipulate that races "must start with athletes jumping into the water from a fixed platform, above water level".